Well, that depends on how you look at it, I suppose. Hi! Hope all is well! I’ve been a bit MIA but working at getting my act back together–just in time for school to re-open, right? 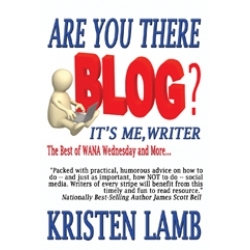 So I just finished reading Kristen Lamb’s, We Are Not Alone–The Writer’s Guide to Social Media (WANA, from here on). WANA is probably the first non-fiction book I couldn’t put down. Kristen’s quirky sense of humor made her walk-through the Big Three (okay, four, but MySpace has sort of gone by the wayside since WANA hit the virtual shelves) fun. Her prose is conversational, easy to follow and steps are laid out so that all you have to do is bookmark your page and/or lay your social media foundation as you go. I promise you, no matter what your level, you will learn something from WANA. Are you a newbie social media wanna be, fearful of how you’ll fare with Facebook, terrified of taking on the Twitterverse and warring with the thought of baring yourself at WordPress blog of your very own? Take heart! Kristen lays out in simple, straightforward terms everything you need to know about getting started in all the above, photos, bios and other necessities included! Are you a multi-published, big-name author who’s been around the writer’s block in traditional and/or indie market(s); you have a clue but no time to keep up? Especially because you’ve got to crank out that next best-seller? Kristin shows you how to manage all those sites via realistic chunks of time. Still too much to handle? She discusses the value of outsourcing, too. Are you semi-savvy in any or all the above? Confirm what you know, get excited about how ahead of the game you are and take your learning to the next level. I’ve got Twitter backgrounds to set, Tweetdeck to check and a Facebook fan page to create. I promise, WANA will be up on my Nook’s screen the whole time–now if I could just figure out how to highlight the pertinent pages by choice and not by fluke! Oh, I also re-created my WordPress profile, added a bio and photo to connect folks to brand Joanna Aislinn. And I will be linking/syncing The Big Three together very soon. After that? Start Kristen’s most recent release: Are You There Blog? It’s Me, Writer. And while we’re talking about linking and syncing, anyone who knows the value of keeping up with all the trends in publishing today will NEED to subscribe to best-selling author Bob Mayer’s blog. The future of publishing really is learned here. Wow. I thought I was going to write a few sentences! Off to a little R & R: Fran Fine calls and my alarm will be telling me it’s time to exercise (again) terribly soon! ← FAFF: This Is Pretty Wild–Check It Out! Thanks for the review. I do believe I’m off to order the book! Um…I need this book. I recently entered the twitterverse and have no idea if I’m doing it correctly. Great post! Hi Joanna! Ordered the book. I’m fairly good with blogging to a degree. Facebook…fair. Twitter, I know just enought to get in trouble. Yes, I need help!! !